In the 20 years since Bill Gates declared, “Content is King,” only one thing is certain. There’s a whole lot of competition to wear the crown. In 1996, when Gates wrote his prophetic essay on content, only 20 million Americans were online. To give those numbers some context, 271 million Americans are online today. In those early days of the world wide web, there wasn’t all that much to do online. Creating a website wasn’t half as easy as it is today, and most news sites barely even registered online. Perhaps not-so-coincidentally, 1996 was also the year the New York Times launched their first website. This is obviously true, which begs the question. Does this claim really give you any clue on how to set your content apart? I would argue no. It’s not enough to just put up a blog or publish white papers and ebooks (remember those?). It’s not enough to be insanely useful. Creating content does little more than meet the bar for entry. I was listening the other day to a podcast about a lone phone booth in the Mojave desert. 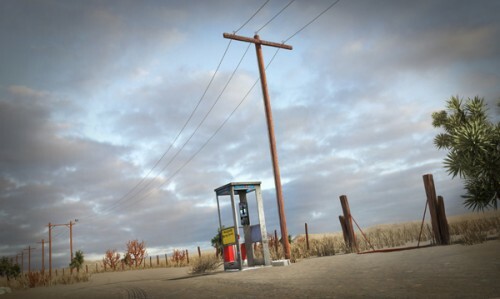 This phone booth, out in the middle of nowhere, should have lived a long, obscure life out in the desert. Instead, it captured the public’s imagination, to the point that it attracted so many visitors that the National Park Service removed all traces of the booth to discourage people from visiting the site. The Mojave phone booth’s remarkable story starts in 1997, when Godfrey Daniels became fascinated with a report that there was this random phone in the desert. He became obsessed with calling the booth several times a day, wondering if anyone would ever pick up. After a month of daily dialing, a woman answered. Because Daniels was an Internet entrepreneur, he created a website for the booth. And to his complete surprise, his obsession spread to people around the globe. Although the phone booth is no longer there, the fame of the Mojave phone booth begs the question. Why did it inspire such a devoted following? The reason people were so attracted to the booth was that it was just so unexpected. It wasn’t located in a city, like most phone booths. It wasn’t at the side of a major interstate, which might have been understandable. It was 8 miles from the nearest paved road. Remember 1997? Not only was the Internet not all that populated yet, but also the Nokia was the hottest thing happening in the world of cell phones. Coming across a story about a phone booth in the middle of Los Angeles would have been unremarkable. But a booth in the Mojave? Yet many businesses and organizations model their content on the competition. It’s natural to look around and see what’s out there. In fact, we generally start client projects this way! But the goal of this landscape survey isn’t to build just another phone booth. It’s to figure out what is unexpected about your brand. This might sound obvious, but I’ve worked with product designers who leave out their company’s commitment to green practices, because they think, “No one cares,” and coaches who can’t articulate what their special sauce is to customers. This is a big problem, because the way to set your content, and by extension your brand, apart is to drive home that difference. Consider your audience. When they first find your website, they have a predetermined set of expectations and questions that are all driven by past experiences. You can probably predict exactly what they would ask if you got on the phone with them. Click here for our audience swipe file, and never wonder again what questions and topics your audience cares about most. You absolutely should answer their questions (that’s being relevant and useful), but there’s incredible power in subverting expectations. This is something Brené Brown does beautifully. Instead of telling her audience that they shouldn’t worry about what people think, or giving them tips on finding a partner, Brown gives an unexpected answer. Standing out among the competition isn’t about being the loudest voice or the most controversial. It isn’t even about being the best at self-promotion. It’s knowing your audience deeply, understanding what their questions, concerns, hopes and dreams are. It’s taking the time to find out what else they’re being exposed to. And consciously putting forward the products or ideas that offer an alternative point of view. Who does my organization serve? What do I represent that’s different than everything else they’re finding in the market? LOVE THIS POST? THEN YOU WON’T WANT TO MISS THE NEXT ONE. You can expect to get email updates from B and our free template for creating your own Audience Swipe File. LOVE THIS POST? THEN YOU WON'T WANT TO MISS THE NEXT ONE. We will never, ever share your email address with a 3rd party.